COLUMBUS — Northmor’s Conan Becker is the only area wrestler still in contention for a medal at the state wrestling tournament in Columbus. 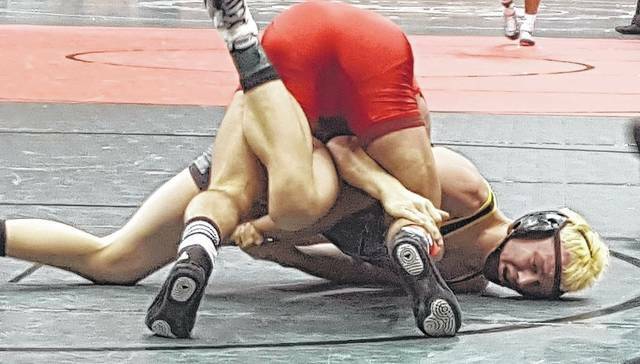 After the second day of the 80th state tournament, Conan Becker is guaranteed at least a sixth-place finish when action continues this morning at the Schottenstein Center on the campus of The Ohio State University. Conan Becker won his first two matches of the tournament before being sent to the consolation bracket on Friday night. Noah Mattin, of Archibold, handed Becker his first loss, 6-4. Now wrestling in the consolation bracket semifinals, Conan will lock up with Brian Persinger of Wooster Triway. After a first-round defeat, Persinger has won four straight to advance to face Conan Becker. Three other Northmor wrestlers and Garrett Kuns of Galion were eliminated Friday. In the 170-pound consolation bracket, Kuns faced off against Brett Posey of Chillicothe Zane Trace. The match was a 2-0 decision in favor of Posey, ending Kuns’ run. Also for the Knights, Jake Neer was eliminated from the consolation bracket on Friday morning by Graham Shore of Casstown Miami East in the 120-pound weight class. Shore by technical fall, 21-6. In the 145-pound class, Conor Becker was defeated by Chase Moore of Swanton by a 5-3 decision. After winning his opening-round match, Conor suffered two losses in a row and was eliminated from the competition. Matthew Ross, Northmor’s wrestler at 152-pounds, also won his first match. On Friday morning, Ross lost his second consecutive match, falling to Wyatt Lefker of Williamsburg via pinfall in 1:32..
145-pound Conor Becker’s season ends after a 5-3 decision in favor of Moore. http://aimmedianetwork.com/wp-content/uploads/sites/38/2017/03/web1_Conor-Becker-dropped-cropped-at-state.jpg145-pound Conor Becker’s season ends after a 5-3 decision in favor of Moore. Kuns’ season is over after dropping a hard fought 2-0 decision to Posey in the 170-pound class. http://aimmedianetwork.com/wp-content/uploads/sites/38/2017/03/web1_Kuns-falls-2-0-to-Posey.jpgKuns’ season is over after dropping a hard fought 2-0 decision to Posey in the 170-pound class.